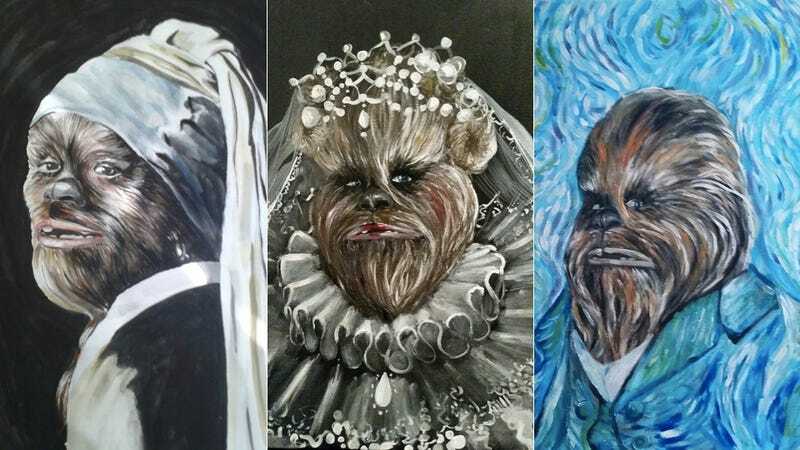 Chewbacca is given a high art makeover in several paintings by artist Christine Parisi. And he is goddamn beautiful in every single one. Behold the hairy majesty. All works of are here from artist Christine Parisi, who has posted her work on her Facebook account. (There's a lot more make sure you check it out.) Also, the artist has asked for more Wookiee inspiration. What would you like to see Chewy as next? Personally, I think a Wookiee wedding Jan van Eyck-style could be pretty intense. But I'm just spitballing here. Wonderful work! You can see these bad boys live and IN PERSON at the Chicago bar Reeds Local (where I happened to stumble upon these bad boys myself). And last I checked a few paintings were still available for purchase. The "Girl Wookiee the Pearl Earring" is definitely a favorite of io9. Beautiful. See additional Wookiee (and Trek) art at Christine Parisi Art. Prints are also allegedly available at the link.